Director – W.D. Richter, Screenplay – Earl Mac Rauch, Producer – W.D. Richter & Neil Canton, Photography – Fred J. Koenekamp, Music – Michael Boddicker, Senior Visual Effects Supervisor – Michael Fink, Animated Visual Effects – VCE Inc (Supervisor – Peter Kuran), 8th Dimension Sequence – Greenlite, Inc. (Supervisor – John Scheele), Special Effects Supervisors – David Blitstein & Henry Millar, Makeup – The Burman Studio, Inc., Production Design – J. Michael Riva. Production Company – Sherwood Productions. Neurosurgeon, rock star, comic book hero and crimefighter Buckaroo Banzai follows his lengthy list of accomplishments by using his invention of an experimental oscillation overthruster unit to drive a car through a mountainside into the eighth dimension. At the press conference afterwards, Buckaroo is interrupted by a call from the Black Lectoids from the Planet Ten in an orbiting spaceship who give him an electric shock that ionises and enables him to see the presence of several invading Red Lectoids disguised in the audience. The Red Lectoids, who all have the first name John, want to steal the oscillation overthruster so that they can return to the eighth dimension. They have been stranded on Earth since 1938 when they arrived during the Orson Welles ‘War of the Worlds’ broadcast, using the hysteria to help cover their arrival. The Black Lectoids now threaten to trigger actions that will set off a nuclear war unless Buckaroo helps stop the Red Lectoids from returning to the Eight Dimension. 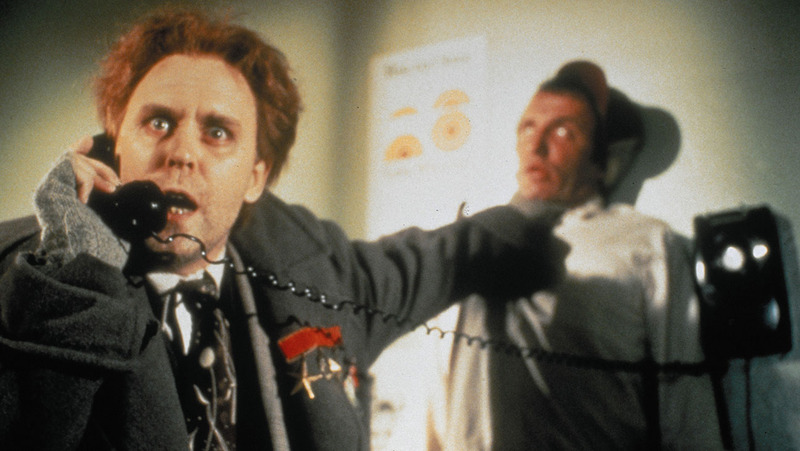 The Adventures of Buckaroo Banzai: Across the 8th Dimension is an object lesson in how to create an instant cult film. Buckaroo Banzai fulfills all the requirements of a cult film – it is exceedingly eccentric, it was a commercial failure at the box-office, it instantly received a fan clique – all without it ever being a particularly good film. Buckaroo Banzai is like a Doc Savage story updated with a hip attitude that lets it play the absurdities of all the heroic poses up in po-faced deadpan. The film is loaded with wall-to-wall incongruities and throwaway non-sequitirs. Herein lies the fault however – what one gets is mostly a private gag that keeps on running oblivious to its audience. Narrative and drama are entirely lost in the continual escalation of complicity and seemingly the introduction of a new subplot every five minutes. Nor is any of this helped by director W.D. Richter’s insistence on having all the character’s rabbiting away at their dialogue with rapid-fire simultaneous banter. In all of this, the action is so constricted it never gets the opportunity to open up and be superheroic. One joy however is the performance of John Lithgow, who goes full tilt with all the wild eye-rolling, giggling megalomania and mouth-pinched muttering he can muster. One expects similar things in the casting of Christopher Lloyd who tends to specialize in these type of roles but who instead remains entirely anonymous under one of Tom Burman’s unconvincing rubber masks. Peter Weller plays with just the right degree of deadpan heroic stature and a cheeky Ellen Barkin is well paired up against him. The film optimistically announced a sequel Buckaroo Banzai Against the World Crime League on its end credits but despite a dedicated fan following such has never emerged. 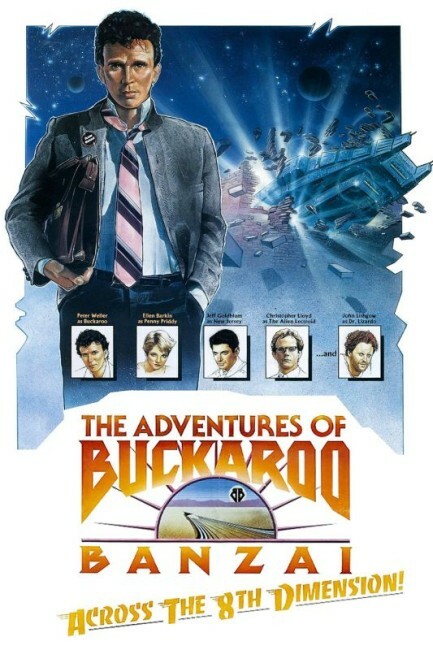 The recent years also saw rumours of a possible Buckaroo Banzai tv series but neither did this emerge. Director W.D. Richter has worked on a number of other genre films. He delivered the scripts for Invasion of the Body Snatchers (1978), the Frank Langella Dracula (1979), John Carpenter’s Big Trouble in Little China (1986), the Stephen King adaptation Needful Things (1993) and Stealth (2005) about an artificially intelligent stealth bomber, as well as directed the fine cryogenic sleeper awakes film Late for Dinner (1991). Screenwriter Earl Mac Rauch had previously written Martin Scorsese’s New York, New York (1977), the Sean S. Cunningham thriller A Stranger is Watching (1982) and went onto the gonzo John Belushi biopic Wired (1989).